A host of water soluble materials are available to source most of the important oxides needed in ceramic glazes. However such materials cannot normally be used in glazes. Why? Because glazes are suspensions of particulate materials, not solutions of soluble materials. Such suspensions have a far lower water content than a solution could ever have, this is necessary to create a slurry that will deposit an adequate thickness when applied to ware. Because most ceramic powders do not react much with water, a clay or glaze slurries can be stored and the rheological properties do not change. However if a soluble material is added to glaze suspension the usual result is a destabilizing (change over time) of its flow properties (viscosity, thixotropy). Worse, if a glaze slurry containing a soluble is applied to ware, especially bisque ware, the water is absorbed into the body and the solute goes with it. This changes the firing behavior of the body and leaves the glaze matrix devoid of (or with less of) the oxide the solution was intended to supply. This being said, many materials used in ceramics are slightly soluble over time. This includes nepheline syenite, lithium carbonate, gerstley borate, colemanite, ulexite, strontium carbonate and frits. 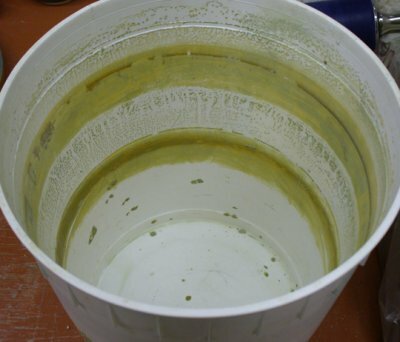 Understandably we can expect changes in the viscosity and thixotropy of glaze slurries that are stored for long periods. The fact that small crystals (precipitates) can form in stored glazs is a testament to the solubility of one or more materials. Various other important factors play in material solubility. For example, interactions. These can be complex. One material that dissolves could produce something that acts as a catalyst for another to begin dissolving (e.g. CO2). Temperature is very important, the solubility of a powder suspended in water could increase by an order of magnitude if storage room temperatures get high. 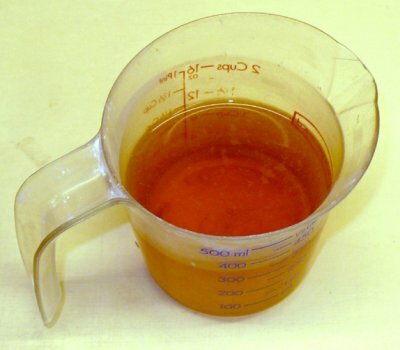 The presence of deflocculants or flocculants (which are dissolved) not only affects the initial viscosity of a glaze slurry, but can affect its stability. This is because lower water content systems (deflocculated ones) can have a more fragile rheology (more subject to change with time). Another factor is the purity of the water itself (the ions that it introduces into the system). Clay, feldspar, wollastonite, silica and frits are insoluble. Right? Wrong! That is what the glaze was made of that was in this bucket. The scum on the inside is so hard that it is extremely difficult to remove, even using a scraper or a scrubber. Even lime-a-way does not remove it all. This is an example of how water-soluble materials can be. When this glaze settles out the water on top is brown (like this scum) yet all the material powders are white! So it is not surprising that glaze viscosity changes over time and things dissolve and impact rheology. Frits do not dissolve in water, right? Wrong. 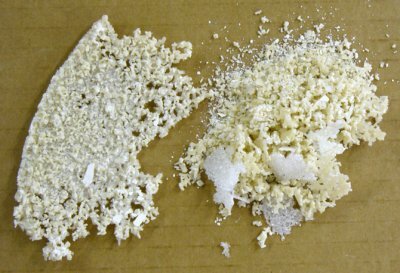 This is an example of two types of crystals that have formed on the surface of a fritted glaze after a long period of storage (Ferro Frit 3249 in this case). Frits are formulated to give chemistries that natural materials cannot supply. To do that they have to push the boundaries of stability (solubility). 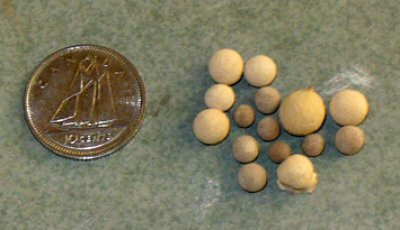 Any frit that has an inordinately high amount (compared to natural sources) of a specific oxide (in this case MgO) or lacks Al2O3 (like Frit 3134) are suspect.